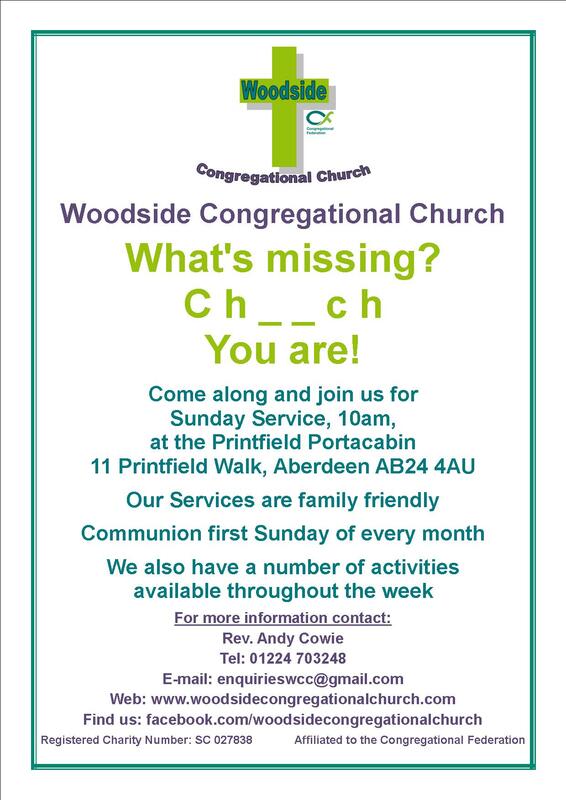 Welcome to the website for Woodside Congregational Church. We meet in the Printfield Portacabin at 11a Printfield Walk (behind Spar on Clifton Road) in Woodside, Aberdeen. Our Sunday Service is at 10am. Please come and join us, we have a seat waiting just for you. We at Woodside know the importance of community. It’s the original social media. What’s important in the commUnity? You are! That’s why we extend a warm welcome to every person that comes through our doors, and we would love to welcome you. Come and be a part of our community and help bring hope and unity back to our diverse neighbourhood. We are all God’s children no matter what our background. We hope you will find our website useful and informative but we would love it if you would visit us in person too. As well as our Sunday Services we have a number of activities and groups which meet on a regular basis. Click on the What’s On link at the top right of the page to find out more. Is to be a fellowship in faith, in worship, in mutual service and in the service of humanity in the community, in the nation and in the world. Our purpose is to spread the Gospel. The congregation see the aims of the Church as a huge but worthwhile challenge and with God’s help, work towards the high ideal of putting their Faith into action. More details can be found under our Mission Section in About Us which shows how we are currently working towards this. Congregationalism is a form of church government where each Church is independent in the management of it’s own affairs. We are Trinitairian Churches, we believe in God the Father, God the Son and God the Holy Spirit. Church membership is a long standing tradition. It is also a means which gives people a sense of belonging. They have made a commitment to attend regularly and taken on the responsibilities which come with it. If you got a gym membership then you would belong to that gym and would be invested in attending as you have made a commitment to yourself to get fit. You have the responsibility of attending and using the facilities to receive the benefits of better health and fitness. The same can be said of Church membership. You are showing that you belong to the Church and are invested in attending as you have made a commitment to follow Christ Jesus. You have the responsibility of attending to hear the Word of the Lord and grow spiritually, sharing fellowship with other members, and you use the facilities to receive the benefits of a richer faith. Attending Church also helps to continue your journey of discovering your faith and helping it to grow. It is not a solo journey but one you take with many. You are not alone, and attending Church helps to remind us of that. It also helps us learn from each other; support and encourage each other, share our stories of life and learn of the life of Jesus. Attending Church also helps us unify under a banner of ministry, mission and outreach. Caring for others whether they be near or far, praying for them, providing physical or emotional support like clothing, food or someone to talk to. These are all values which are core to the Christian faith and the way Jesus taught us to live. We all have different abilities, skills and strengths. By coming together and discerning God’s will, we area able to achieve great things in His name. Whether you are having a great time in life and want to thank God or are going through a rough patch and want to ask God for strength, or simply just need someone to pray with you, we are here. Complete the form below and we will share the basis of the prayer with our congregation and our sister Churches so that we may intercede with you, we will keep your name and personal information private. Find out on our News page. Here you will find out what we’ve been doing and any other news of note. Want to come along to one of our groups/clubs? Head on over to our What’s On page to find the group for you.